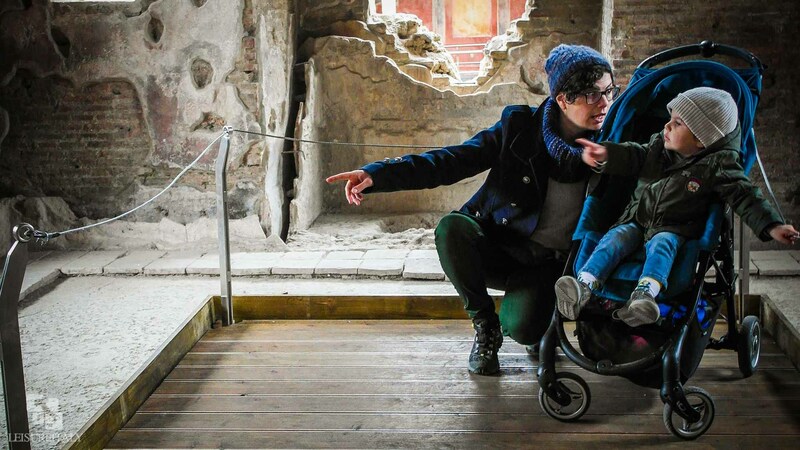 Worried that your visit to Pompeii may be restricted by the reduced mobility of a family member? 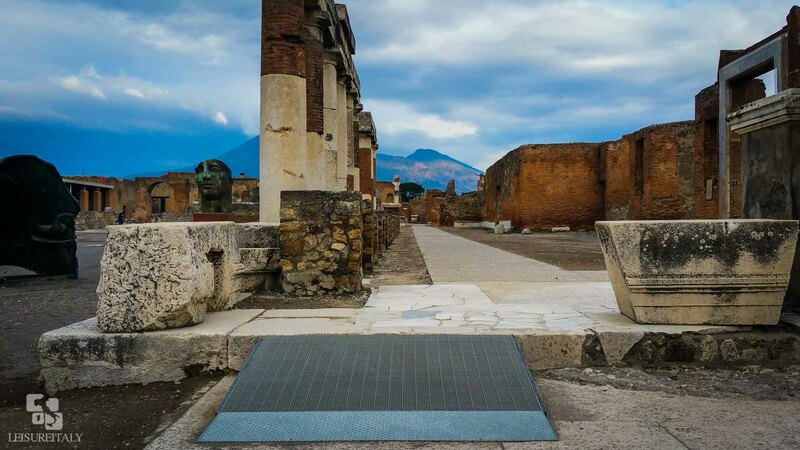 Leisure Italy has expressly designed “Accessible Pompeii Tour” as a friendly tour for wheelchair users, strollers and mobility scooters. The itinerary is tailored along a special path that finally made Pompeii accessible to everyone. 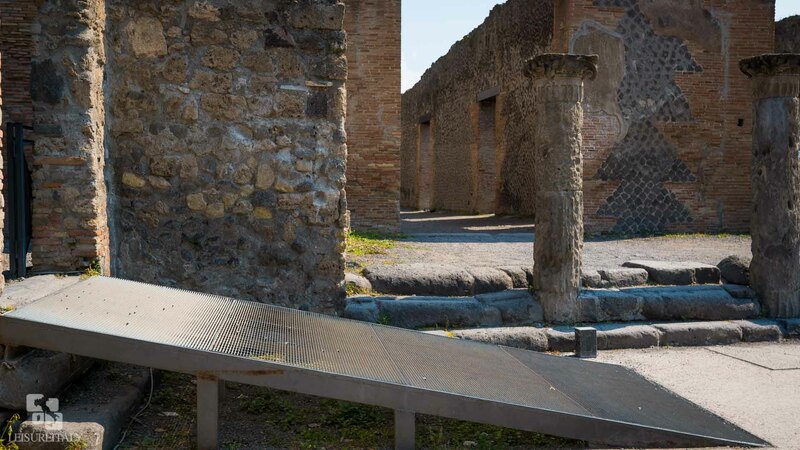 Thanks to ramps and elevators created to overcome architectural barriers, you will be able to experience and explore Pompeii Archaeological Site as an everyone else. With your professional tour guide you will enjoy the visit of amazing buildings with their mosaics and wall paintings. A journey through the Ancient Pompeii to discover how its inhabitants lived before the tremendous eruption of Mt Vesuvius on 79 AD. Ticket Office – Porta Anfiteatro (please be aware that the are several access to the archeological site). 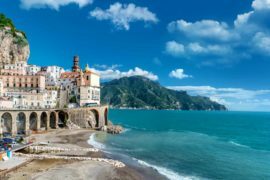 This tour can be combined with any other half or full day tour which includes a visit to Pompeii. The tour will be adapted to the group. The starting point is “Piazza Anfiteatro” but the tour will end at “Piazza Esedra” gate located at Piazza Porta Marina Inferiore. 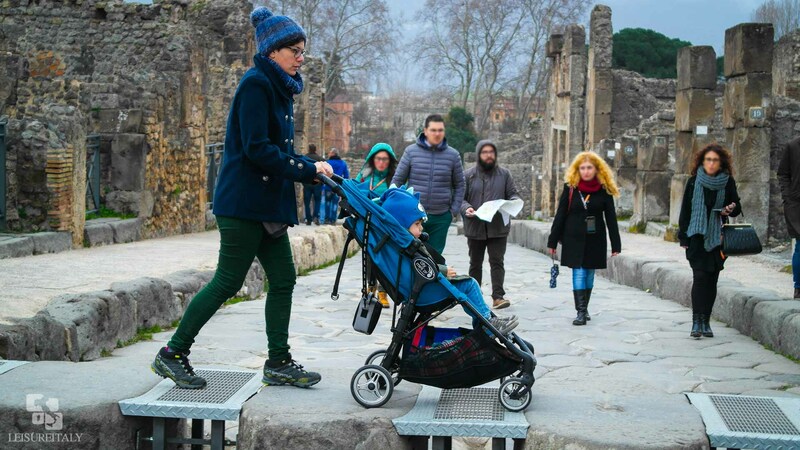 This special Ancient Pompeii Private Tour is baby strollers, mobility scooters and wheelchair users friendly. 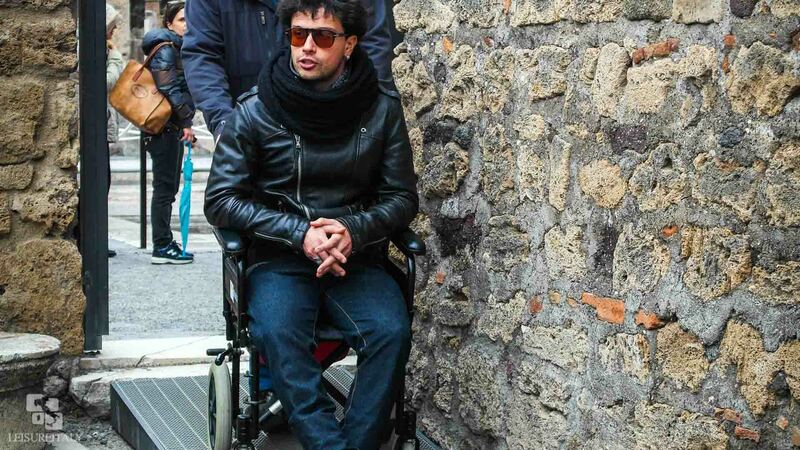 The aim is to create accessible travel resources to allow everyone to enjoy an interesting but relaxing and fun visit to this unique World Heritage Site. 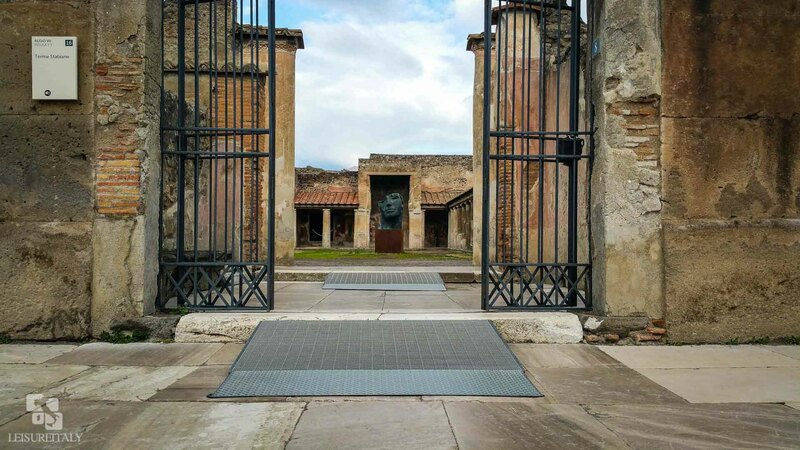 The discovery of Pompeii Archaeological Area will start from the Amphitheatre to make the best of special ramps designed to access many of the ancient buildings and open areas. The Excavations of Pompeii are too big to be visited entirely in one day. Your private guide shall make sure the tour will adapt to your pace and energy. In Pompeii you will first enjoy the city walls, dating back to the pre-roman town (4 centuries BC). Then you will be able to appreciate the outdoors of the amphitheatre, the oldest of the Roman World and on left side the huge building of the Great Palestra (Gym) used for the training of young boys and for gymnastic exercises and sports activities. 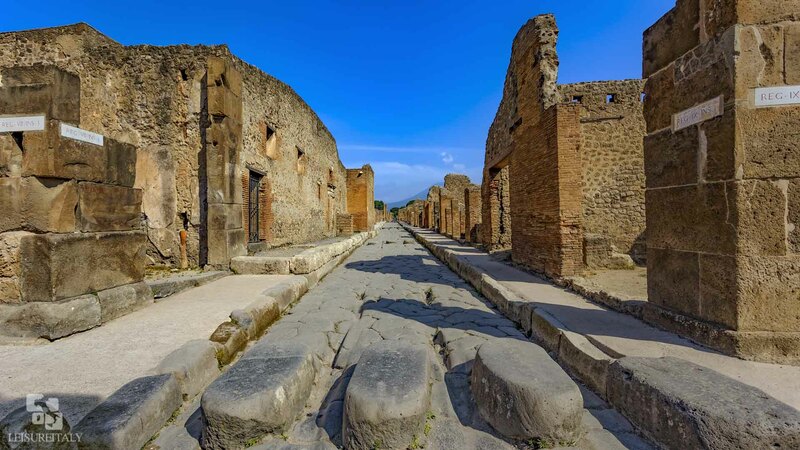 To explore the town of Pompeii you will be using the recently renewed sidewalks and paths made out of smooth concrete. Your attention will be caught by big blocks of basalt emerging from the middle of the road. They were the stepping stones used by pedestrians to cross the road. In Pompeii indeed, differently from other roman towns, there was not a complete sewer system because the city was build on top of a lava platform too hard to be worked. Nowadays it is possible to ride on top of these stepping stones thanks to the ramps pitched properly. During our special Accessible Pompeii Tour you will certainly visit one or two ancient Domus (private houses) . This is probably one of the most interesting building of Pompeii. The pumice stones and ashes coming out from the volcano have in fact buried the town keeping nearly intact shining floors, wall mosaics and colourful wall paintings such as the frescoes. The city centre was called the Forum, it hosts all the buildings with a public function: Religion (the Temple of Apollo, the Capitolium and the Temple of the Emperor), Trade (the meat and fish market called Macellum, the textiles market headed by a priestess called Eumachia), Administration (the Basilica) and Politics (Comitii). Other facilities in the Forum where exchange offices, public restrooms and a public scale (tabula mensurae) where to compare and weigh farmer’s products. In the Forum you will also see a display of the well-known plaster casts. Close by there were public thermal baths where both men and women (in different sections), poor and wealthy, free and slaves could enjoy daily hygiene. Pompeii had 3 of such complexes in town plus 2 right outside the city walls, all provided with following facilities: a changing room (apoditerium), a tepid room (tepidarium), a hot room (calidarium) and a Gym (Palestra). 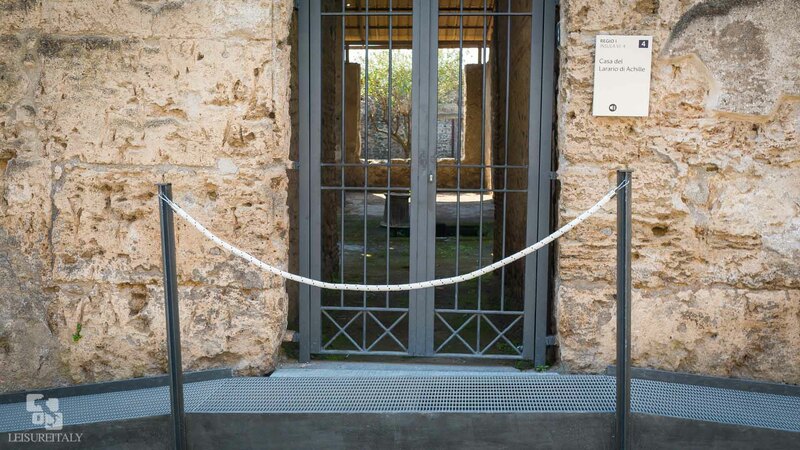 You can easily visit the Termae Stabiane by using the access ramps in order to explore the area which was open to the female public. You will notice several places overlooking the road with large vases built in a masonry counter: this is what the Romans called popinae or cauponae, today’s taverns! In fact those terracotta jars where filled up with food and beverages, and many ancient Pompeians used to stop in such places for lunch. On our way out you will use the specific elevator made for travellers with special needs. This will also give you the chance to stop at the Antiquarium for watching the video of the Virtual Reconstruction of the Eruption and to buy souvenir at the Book Shop if requested. By the exit are also available wheel-chair accessible restrooms.